PowerMTA,handling very high email volumes easily, is a very specialized email delivery solution and the leader of email gateway solutions.PowerMTA is compatible with any SMTP compliant email feeder.Integration via various API allows marketers to leverage their infrastructure maximizing ROI.Advanced features such as VirtualMTA support,easy ip rotation,domain based throttling,mx based connection limits,talking and acting based on smtp errors make it easier for marketers to bulk email to their large email lists and send campaigns without a hassle while complying with spam policies,isp limitations.Port25,the makers of the powermta software, offers the support for windows and *nix systems,a good pricing with some discounts,installation and maintenance. With PowerMTA you could easily achieve high sending rates and maximum delivery to the inbox! It is by far the best smtp software,email gateway in when compared to other players on the market. 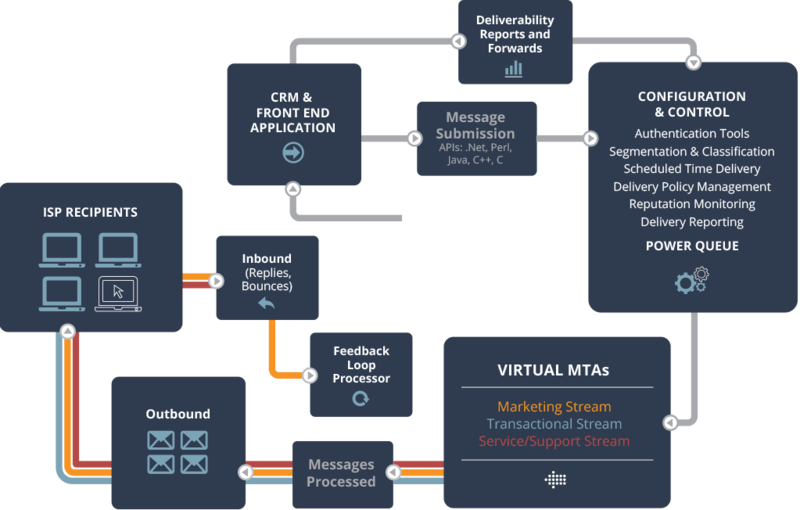 Integration with Authentication standarts such as dkim,domainkeys,dmarc..
PowerMTA is installed on more than 4000 servers,60 countries worldwide.Companies such as NY Times,ExactTarget,Forbes and Responsys use PowerMTA to send their campaigns. As the sending industry moves to a more secure and encrypted sending model, you will be increasingly required to track whether a message was delivered over a secure socket and, if so, what protocol and cipher were used. PowerMTA™ solves this problem by utilizing the Transport Layer Security (TLS) protocol over SMTP for certificate-based authentication that provides security-enhanced data transfers using symmetric encryption keys. Advanced TLS handshake performance optimizations benefit high-volume senders by allowing you to use opportunistic TLS globally while having thousands of simultaneous outbound connections active. This feature is available with the Enterprise license.